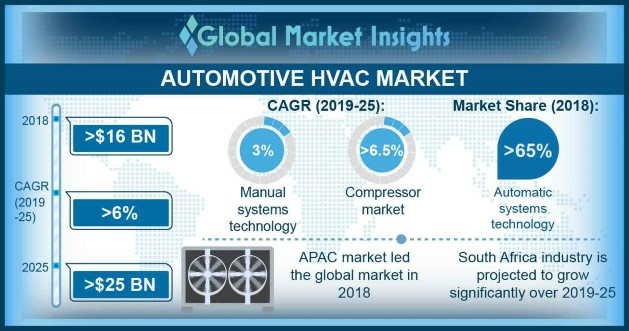 Automotive HVAC Market size is set to exceed USD 25 billion by 2025; according to a new research report by Global Market Insights, Inc.
HVAC systems have become standard systems that are integrated even in entry-level automobiles. The increasing demand for more comfort and luxury features in vehicles by the consumers is driving the automotive HVAC market. These systems control and monitor cabin temperature to offer optimum convenience to the passengers. Adequate flow delivery, low acoustic noise, and low energy consumption for flow delivery are some of the major parameters that decide the efficiency of these systems. Each manufacturer in the automotive HVAC market offers distinct designs for different vehicles to deliver the most appropriate cabin climate control system. However, they all integrate certain additional controls in the control unit, temperature sensors for different areas, HVAC control unit for rear seating areas, ducts, and several vents to maintain the airflow inside the vehicle. The increasing need for advanced motor control & energy management systems in the newly developed vehicles to maintain energy efficiency and low fuel consumption parameters is driving the automotive HVAC market growth. In addition, increasing electric vehicle sales globally is a major trend supporting the industry. According to the International Energy Agency, in 2017, over 1 million electric vehicles were sold globally. The American region had approximately 760,000 and 820,000 in Europe. However, China accounted for the largest electric cars fleet in 2017 with about 1.23 million cars. The country had generated the highest number of EV sales with about 579,000 units sold, which is more when compared to the U.S. These vehicles will require efficient systems installed to regulate the temperature in battery-operated vehicles. Manufacturers are adopting several novel technologies to address the comfort inside electric vehicle cabins. They are developing new designs of coolant flow systems, using heat pumps and vaporized coolants such as Co2 refrigerants, fueling the automotive HVAC market. Many countries have laid stringent fuel efficiency standards for their vehicles that require automobiles to offer high performance, augmenting the automotive HVAC market. These regulations have been enforced to address the growing environmental concerns such as ozone layer depletion and global warming due to the increasing CO2 emissions. This is creating positive growth prospects for the automotive HVAC market. The regulations and standards have resulted in consumer awareness about using vehicles that comply with them and produce less pollutants. This has encouraged the suppliers to upgrade their variable and fixed displacement type compressors. For instance, in North America, the transition from fixed displacement type compressors to the variable has shown a considerable growth with the regional suppliers focusing on increasing performance of these systems while maintaining the costs of these systems. South Africa have been witnessing high demand in the automotive HVAC market due to the growing production light commercial and passenger vehicles. The producers in the region mainly include European companies, followed by Asian and American players. These include Toyota, Volkswagen, BMW, Ford, Nissan, Mercedes, etc. Major operations include exporting to the U.S. that comprises cars such as left-hand drive BMW 3-Series, Ford Ranger, etc. According to the National Association of Automobile Manufacturers of South Africa (NAAMSA), the overall revenue from the automotive sector in South Africa was over USD 42 billion in 2017. Improving relationships with the U.S. will result in increasing the revenue from automobile export activities, creating a demand for production. These factors coupled with high requirements from vehicle production sector is creating several opportunities for the market growth. The automotive HVAC market is highly consolidated with few companies offering HVAC components and integrated HVAC systems. Major companies in the market include Hanon Systems, Valeo, Denso Corporation, Air International Thermal Systems, Calsonic Kansei Corporation, among others. The presence of established companies in the automatic HVAC market creates stiff competition, creating huge barriers for new entrants.